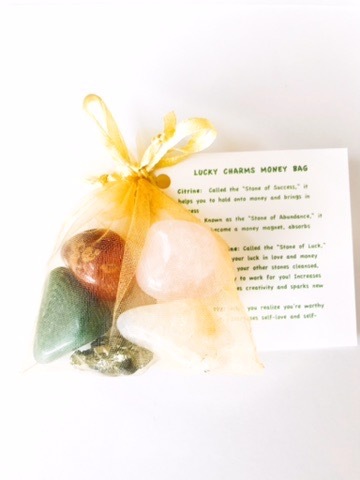 Enjoy the benefits of financial abundance when you carry your Lucky Charms Money Bag. 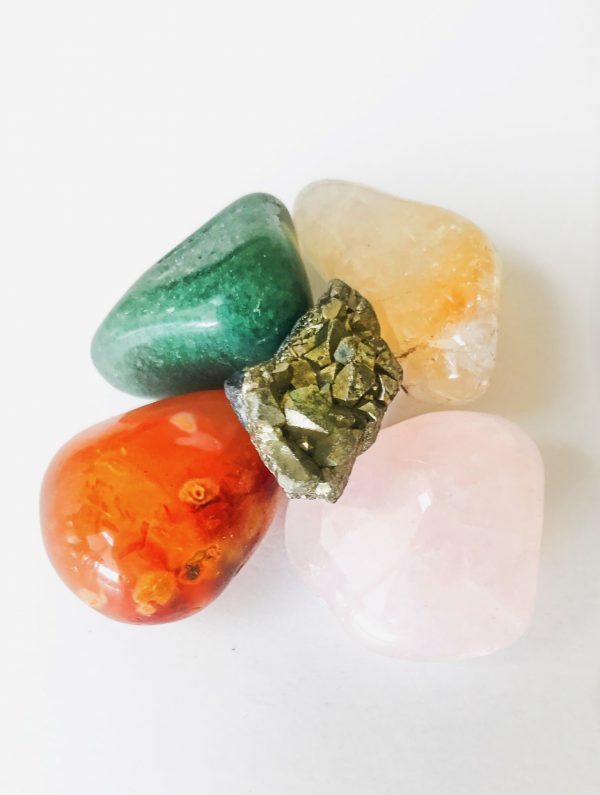 This combination of stones will help not only attract money but will help you hold onto the money you attract as you send out energetic vibes of success, confidence and abundance. Carry your Lucky Charms bag in your purse or keep it at your office. You can also keep it near the place where you store your bills and checkbook. You can use your stones to create a crystal grid for abundance. Or you can write an affirmation for yourself such as “Every day I pay my bills with ease and have money left over for savings and fun” and then place these stones over that affirmation. You can also keep your Lucky Charms bag in the money corner of your home which, according to Feng Shui, is the opposite left corner from your front door. Pyrite: Known as a Stone of Abundance, Pyrite can also be carried for protection against bad luck. It’s also a stone of action. 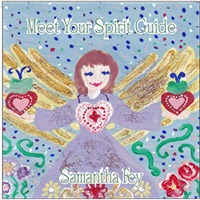 Place it in your home or office to increase energy and vitality. Pyrite will increase your self-worth making you a magnet for success and abundance. Place on your desk at work to encourage leadership and ideas. Carnelian: Helps you to feel confident about your place in the world and will give you the courage needed to speak your truth. It brings joy, energy and renewed passion to creative endevours. It never needs to be cleansed and will work to keep the stones around it clean and clear and ready to work for you. Keep a piece by your bed to increase romance in your life. Keep a piece in your car for protection. Meditate with Carnelian to help you learn how to live in the present moment. Citrine: Will help you to feel more empowered, confident and courageous and go out to conquer your fears while helping make the world a better place. Put the Citrine on your stomach while meditating and breathe in the energy of this happy yellow stone while visualizing yourself filled with a healing golden light. As it holds the power of the Sun, the energy of Citrine will fill you with warmth, energy and vitality. It instills in you the will and determination to turn dreams and wishes into reality. Citrine can not hold negativity rather it works to transmute it. It’s one of only 2 stones on earth that never needs to be cleansed. (The other is Kyanite). Known as the Merchant’s Stone, Citrine helps you to not only attract wealth but to hold on to it as well. If you’re self-employed, keep a Citrine in your cash register. Otherwise, keep one in your wallet to ensure a steady inflow of cash. Place a Citrine cluster in your home to ensure harmony and mutual understanding between family members. Place a piece of Citrine on your desk at work to ward off jealousy. Meditate with Citrine to help release deep seated anger and old hurts. Wear Citrine to infuse your energy with vigor, strength, stamina and confidence. 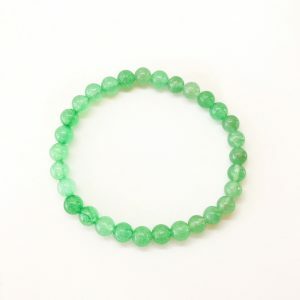 Green Aventurine: Will increase your luck and your ability to bring in more money. The lovely green color vibrates nicely with the heart chakra so it will encourage health, love and healing too. Carry the stone with you in your wallet, place one with your bills or keep one by your bedside to help keep your financial stress at bay. Rose Quartz: Known as a Stone of Love, Rose Quartz helps you learn that you are worthy of success, abundance and prosperity. It works with your other financial stones of abundance to send a subconscious reminder that you deserve to receive abundance. Often the greatest block to success is our subconscious belief that we aren’t worthy. Rose Quartz gently washes these limiting beliefs away and opens the heart chakra to receive more self-love which will help open the door to success. “I love my Lucky Charms Money Bag! I’ve been out of work for almost 6 months but just 2 weeks after receiving your bag, I got a new job! Thank you!” – Charles G.
“Thank you so much for your money bag. After a series of setbacks including surgeries and losing my job, I ordered your bag and several miracles have since occurred. I’ve literally stumbled into a total of $7,000 through a series of fortunate events. 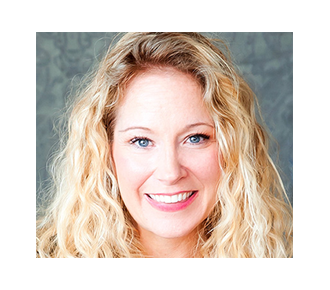 I now take my money bag with me everywhere I go and am ordering more for friends!” — Renee M.
I feel this working in my life!– Nancy F.
I keep this at my desk and I’ve noticed a huge increase in my sales. — Philip S.